Farmers have been advised to grow fewer crops as China, Vietnam's biggest fruit importer, has tightened control over border trade. 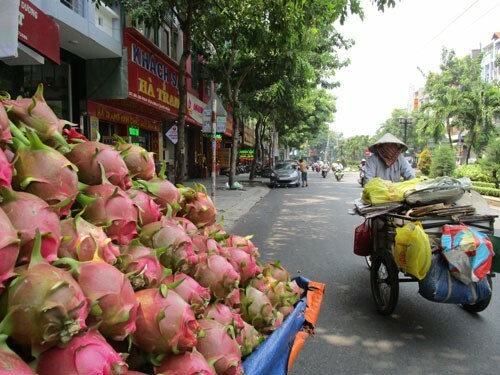 Last year, Vietnam exported a total USD2.7bn worth of fruits to China including dragon fruits, mangos and durians via cross-border trade and official channels. There's no official data about the total amount of fruits exported via the border trade. However, during a press conference last year, Wen Xi Chen, Economic and Commercial Counselor at the Chinese Consulate General in Ho Chi Minh City said border trade accounted for 60% of the total fruits imported into China. Nguyen Lam Vien, vice chairman of Vietnam Farm and Agricultural Enterprises Association said, "Farmers shouldn't keep hoping that they can continue exporting fruits freely via border trade like before. China also helped by lowering import taxes from 17% to 3-4%." Dang Phuc Nguyen, secretary at the Vietnam Fruit and Vegetable Association said, "It takes five to 10 years of negotiation to export another kind of fruit to China. I think farmers shouldn't plant too many fruits to avoid risks." Nguyen suggested that the authorities should provide more information about the market to the farmers to avoid being exposed to price fluctuations. According to Nguyen, even though last year export turnover reached USD3.8bn, most of the exporters are small and tiny firms. Vietnam's fruit export still has huge potential since the demands from overseas are high. "Currently, only 10% of the crops meet VietGAP and GlobalGAP standards. If we can raise the rate to 60%, we will not have to worry much about the outlet so in the end, it's all about being professional, safe and traceable," he said.